The posture, the mastery of breath, the composure, the concentration, the immersion, and the union, these are the six limbs of Yoga. Shadanga is a Sanskrit term meaning „six limbs“. 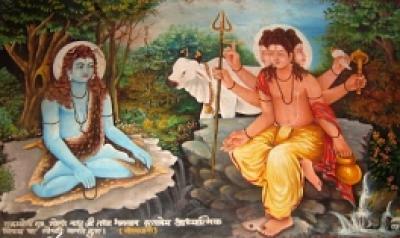 Shadanga Yoga is a traditional variety of Hatha Yoga. To reach the goal of Yoga six methods are used in a gradual way, one stage depending on the other and all interacting with each other. By the practice of the six limbed Yoga body and mind are equally trained. In this way health and well-being, as well as mental equilibrium, is achieved. The achievement of balance and strength is not confined solely to the time of the exercises but influences the quality of day-to-day activities thoroughly. The methods of Shadanga Yoga lead to a natural, inherent balance. Two basic foundations of this type of Yoga are the achievement of spontaneous naturalness (sahaja) and equanimity (sama). Asana (bodily postures) strengthen the body by muscular build up, activate the glands and organs, create strength and endurance. The body is made flexible and smooth by stretching of the tendons and ligaments. The joints are strengthened, the metabolism is activated and the body detoxified. Pranayama (breath control) quietens the mind, and leads to inner balance. By breathing the body is supplied with life force and therefore breath control influences the body's overall energy system. The coordinated interaction of breathing and body postures deepens the practice of Asana, leading to relaxation and de-stressing. The inner peace derived through this method prepares the foundation of the practice of the third limb of Shadanga yoga. Pratyahara (composure) the third limb, allows Self reflection. By the practice of Asana and Pranayama the mind is quitened and awareness is liberated from distracting external influences, the mind is at rest and concentration is trained. The ability to resolve conflicts is heightened and aggression is reduced. Pratyahara is the foundation of the other stages of the mental training of Yoga. The next two stages are Dharana (concentration) and Dhyana (immersion). They are taught when the student is prepared by prolonged practice of the prior three limbs. These meditative absorptions liberate the mind from traumatic burdens (Samskara) and impurities (klesha), and are enabling the attainment of inner peace. The highest stage, Samadhi (union) fully liberates the mind from its individual limitations.